We’re proud to have been manufacturing and installing high specification washrooms since 2001. From commercial and residential to leisure and education, we’ve used our expertise to deliver high quality and innovative washroom projects on schedule and within budget to a wide range of sectors. 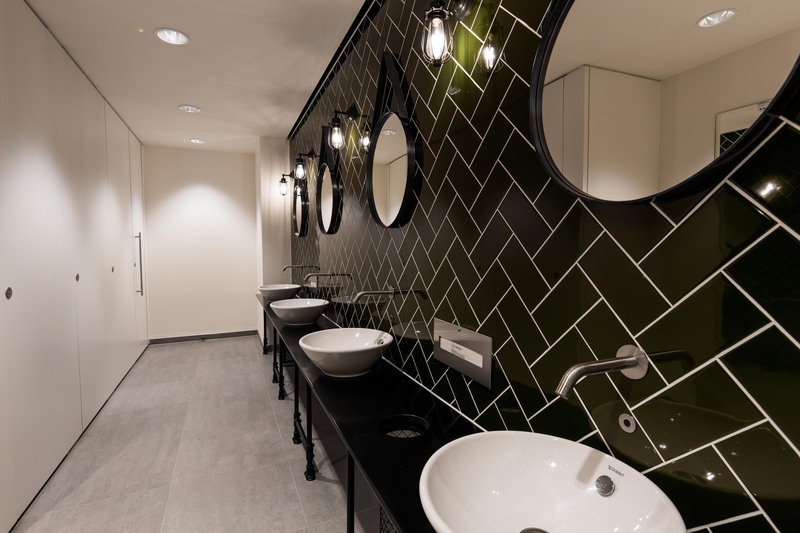 One of the main sectors we operate in, our commercial washroom offering has allowed us to become a key player – producing inspirational washroom spaces for offices. In order to keep commercial buildings profitable, it’s important to stay ahead of the latest trends. Our Iconica collection of unique designs, materials and finishes was created with this in mind and provides our clients with a regularly updated collection of design options in line with the latest trends. Whether for the private or public sector, we’ve designed and installed a multitude of innovative washroom, shower and changing areas for sports and leisure facilities. From our Mezzo shower, changing and toilet cubicles to our Forza flush fronted solid laminate locker, to our innovative range of Arpeggio vanities and benches, we’re able to deliver the performance requirements of virtually any leisure project without compromising on aesthetic appeal. See our leisure sector case studies here. Our knowledge and expertise in the commercial and leisure sectors has allowed us to create high specification washrooms for luxury residential developments. Often working alongside our partner company, Cre8 Joinery Solutions, we’re able to deliver unique finishing touches for high end residential projects – with London’s Parnell House the perfect example. When creating washrooms for the education sector, an important consideration is ensuring the space is suited to all end users, which can be a combination of both staff and pupils from nursery age up to teens. Our washrooms address potential education-specific issues such as bullying and vandalism to ensure they will withstand all the challenges of a busy school environment. Take a look at our education case studies to find out more. We have created a number of high quality washroom facilities for the healthcare sector, using easy-to-clean and maintain products such as our Concerto integrated panelling system, as used at North Middlesex University Hospital London. Our specialist joinery division has also provided bespoke joinery works for wards, receptions and nurse call stations, meeting specific design requirements for both the private and public healthcare sectors. Our products are designed to be as practical as they are stylish, making them the ideal choice for public sector projects including secure accommodation settings. Not only are we NOMS Safe Cell Compliant and Home Office approved, but we also work to BREEAM standards where required. The bespoke joinery items and washrooms we delivered for Wymondham Police and Investigation Centre in Norfolk demonstrate what we can do in this sector. If you’re working on a washroom project this year, whatever the sector then be sure to get in touch with us.